The Si750m is a compact mouse that slips into a small pocket or pouch but performs like a pointer twice its size. It's tiny, but still practical. The back of the mouse has a compartment that opens up to reveal a battery slot and sled for docking the mini dongle receiver. The mouse needs one AA battery, and Kensington reckons that will give you six months of use, which seems a reasonable assertion if you remember to turn it off when not in use. Just dock the dongle into the mouse to switch it off. The signal strength is quite phenomenal due to the 2.5GHz wireless technology powering the reception. With the dongle plugged into a low-powered keyboard USB port we could still control the Mac OS Desktop from 20 metres or so away, with very little latency. With this mouse you could easily place a MacBook next to a projector at one end of a hall and control the display using the mouse from the other end. This mouse is also able to track accurately on just about any surface. Our test gives the mouse six surfaces to work on. Some mice have trouble with red and blue coloured surfaces, which can compete with the colour of the laser beam. 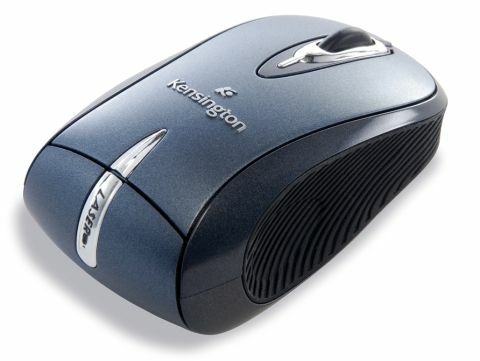 The Kensington mouse did consistently well on all surfaces, except a highly reflective plastic one. If you have a glass-top desk you would need a mouse pad to use this mouse. Other features include a green and red battery indicator that will let you know when performance is about to weaken due to low power. You get left- and right-click buttons and a scroll wheel, which also acts as a further click button. The mouse doesn't come with software for programming the buttons and no installation is needed - just plug it in and it works. At times, you may have to reposition your hand to get control, especially to operate the scroll as it's so tiny, but that's our only complaint. Overall, we recommend it for mobile Mac users.